As a salesperson, one of your key tasks in converting a prospect into a paying customer is to provide accurate quotes quickly and efficiently. The faster you can get the quotes out, the quicker you can get a response from your prospects. Creates the quotation document that can be emailed or printed for the customer in PDF format. Automatically posts to your Opportunity Pipeline within the CRM system. Generates a quote follow-up activity. Upload multiple products and pricing from an Excel file. Update your pricing automatically by uploading your latest Excel price lists. Pricing features: Include cost and selling prices, product codes and descriptions, product narratives, pictures and more. You can also store customer contract pricing that defaults onto individual customer quotes. Multiple price lists can be stored and customers flagged for the appropriate price list – this integrates to Pastel multiple price lists. 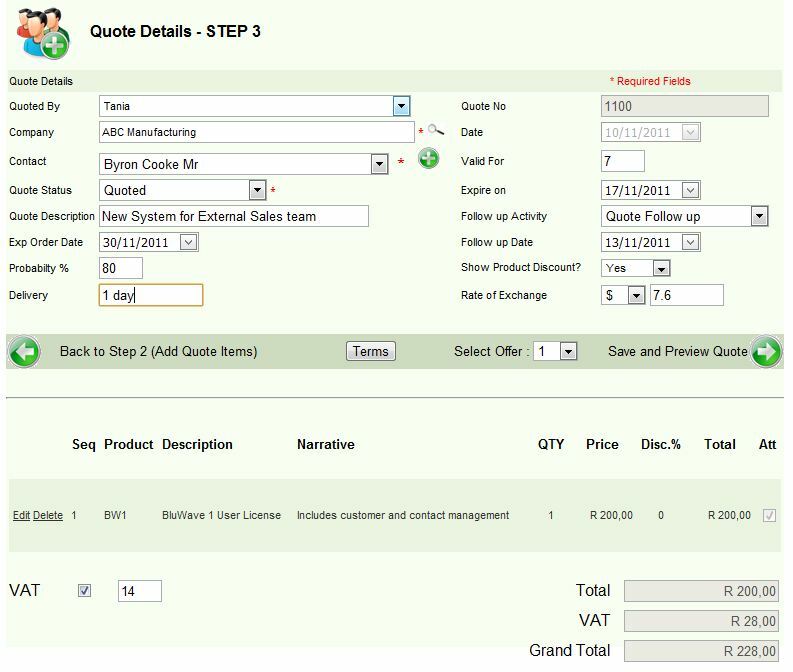 Track quotes easily and simply: Each quote sent is automatically filed into the document management storage area of BluWave CRM, and in the activity history of the customer with a link to the quote document. 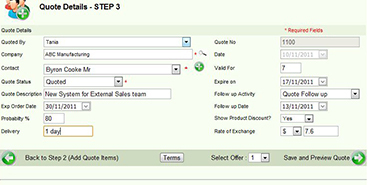 A quote approval process: This can be activated where sales staff vary their selling prices. Want to know more about how you can seamlessly manage your prospects with our automated quotation software? Contact us today.